BAR 16 is a show-within-the-show at the NRA Show, highlighting cocktails, wine and beer. While most of the demos and samples focused on alcoholic drinks and pairings, a couple of exhibitors passed out food samples made with products typically used in cocktails. This barbecue sauce is a riff on the Dark ‘n Stormy, a drink made with ginger beer and rum that currently is trending on bar menus. 1. In medium saucepan, whisk together all ingredients except chicken; bring to a boil. Reduce heat to medium; simmer for 30 to 40 minutes until barbecue sauce thickens. Let sauce cool completely. 2. Place chicken in hotel pan; pour half of barbecue sauce over chicken. Marinate chicken in sauce for 2 hours. 3. Preheat grill to medium-high heat. 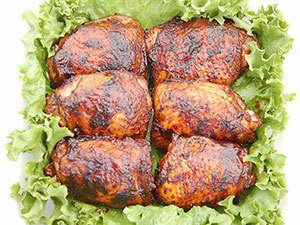 Cook chicken 24 minutes, turning and basting with remaining barbecue sauce every 6 minutes.